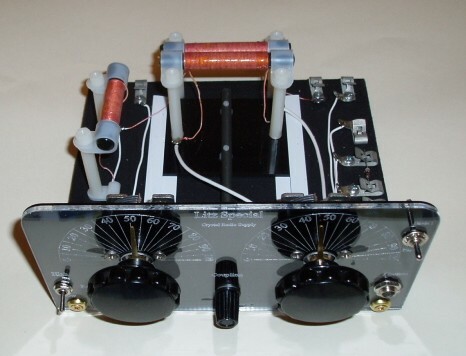 Here is an attractive Crystal Set with outstanding Crystal Radio Performance in both selectivity and sensitivity. It measures 7.5 inches wide by 3.25 inches high and 6 5/8 deep. The base is 1/2 inch thick Black Marine Grade Polymer. The front panel consist of a NEW Engraved Cast Acrylic panel system No paint or lettering to peal off. The coils are wound with 175/46 litz wire and have a Q over 600 at the bottom of the AM band. They are mounted on 1 1/2 inch nylon standoffs. Variable coupling is adjustable from the front panel with a slide arrangement using a nylon rod. Kind of like some of the old Crosley Radios it uses a push and pull motion to change the inductive coupling. A double throw switch mounted on the front panel adds addition inductance for tuning the lower half of the AM band. 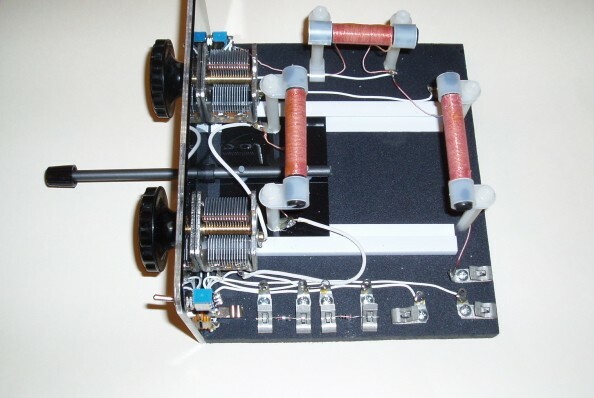 This allows the use of a smaller inductance to tune the upper portion of the band, which means you have a higher Q factor than if one large coil were used to tune the entire band. Diode switching is included with this radio. A front panel mounted double throw switch provides diode selection. And a quick diode change feature using fahnestock clips makes trying new diodes in a side by side comparison a snap. 1N34A and 1N60 Germanium diodes are included. This feature is great for those wishing to switch to a Cat Whisker style detector. A beautiful engraved front panel with three inch diameter logging scales that read from 1 to 100. And large diameter NOS phenolic fluted tuning knobs with custom made brass dial pointers really with make tuning easy. Included are four felt feet to protect your furniture, as I'm sure you will want to display this radio. As with all crystal radios a good outside antenna and ground system are necessary for best performance. The Litz Special uses a push pull motion for inductive coupling like some of the old Crosley Radios. The finger tip inductive coupling adjustment allows every signal to be fine tuned for maximum performance.